When Scout Executive Michael Riley made the choice to eliminate bug juice at the Cape Cod & Islands Council’s summer day camps, he braced for a revolt. But no uprising came. Sugar-saturated bug juice was available one summer, and the next summer only water was served. This positive step toward healthy living will go a long way toward preventing and reversing obesity in Scouts in Michael’s council. But it shouldn’t stop there. Your pack, troop, team, crew, ship or post can be a part of this three-step approach to healthy living known as Drink Right, Move More, Snack Smart. 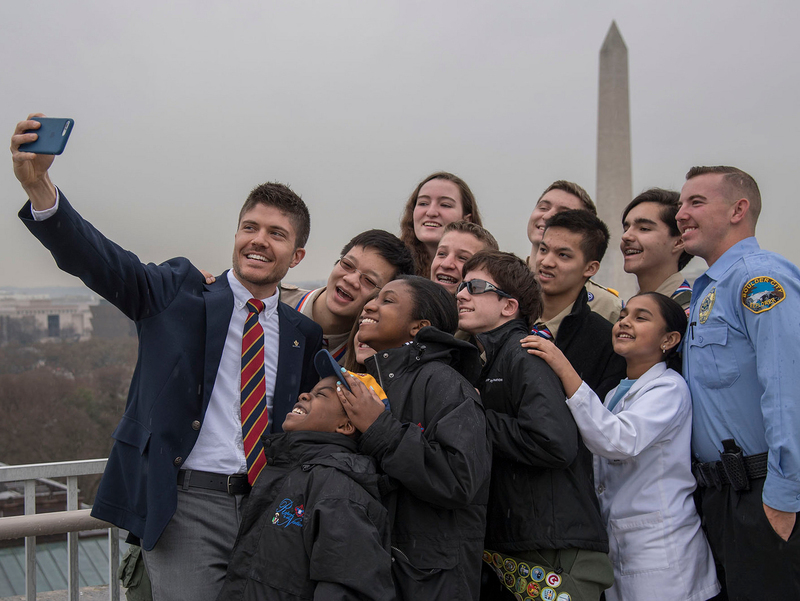 The effort is the brainchild of Healthy Kids Out of School (with major funding from the Harvard Pilgrim Health Care Foundation) and a Boy Scouts of America partner in the push for healthier Scouts. Today we’ll look at Drink Right. I’ll cover the other two in future blog posts. Almost half of the added sugar in the typical American diet comes from sugar-sweetened beverages like bug juice, sports drinks, juice drinks and sodas. Those facts are enough to make anyone pour out their syrupy cup of bug juice. But Michael didn’t need numbers to convince him to make this change. It just made sense. Michael said his council still sells candy and soda at the camp trading post, but now it’s offered alongside bottled water and fresh fruit. “We’re still giving Scouts the choice and hoping they make the right one,” he said. I wouldn’t recommend converting your Scout unit to water-only without first explaining the reasons to your Scouts. And neither would Alyssa Koomas, regional project manager for Healthy Kids Out of School. Try this fun, interactive Sugar Quiz (PDF) at a unit meeting and watch in awe as your Scouts learn what’s really in their favorite drinks. The PDF outlines the materials needed. Basically that’s a few examples of popular sugar-sweetened beverages and about 40 sugar packets. Be sure to include more than just sodas in your demonstration, Alyssa said. Don’t forget about the patch! The Healthy Unit Patch, which encourages units to follow the BSA’s SCOUTStrong recommendations to Drink Right, Move More and Snack Smart at meetings, events and excursions is available free to any unit that completes the 3-6-9 challenge. The “6” in the challenge is “Make water the main beverage at 6 meetings,” which ties in perfectly to today’s discussion. Read all about the Healthy Unit Patch here. At about 55 seconds into the video below, you’ll see staffers at Camp Norse in Massachusetts explain how they’ve benefited by making an effort to Drink Right, Move More, Snack Smart. Does your unit serve sugar-sweetened beverages at meetings? How hard will it be to stop? Share your thoughts below. Healthy Kids Out of School is an initiative of ChildObesity180 at Tufts University with regional funding in Maine, Massachusetts and New Hampshire from the Harvard Pilgrim Health Care Foundation.